Cucamonga doesn’t exist anymore, exactly. It’s old downtown, if that is what it could be called was leveled. 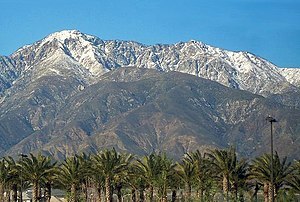 Then Rancho Cucamonga was born, a new creation of modern buildings and stores, its area expanded by grabbing several small unincorporated areas in the vicinity. It looks nothing like the Cucamonga that I remember as a child. I lived on Red Hill, about three miles from the old center of town. Red Hill rose above the old Route 66, with views of surrounding orange groves that extended many miles to the south. For the first year I rode the bus from my house to the small school in Cucamonga. I remember the school buildings and the rooms. One entire wall of each room was glass windows with black-out draperies that would be pulled closed in the event of an attack. It was the glorious fifties when we feared a nuclear attach by Russia. We practiced pulling the draperies closed and climbing under our desks. Its ironic that today we have no windows on our school classrooms, and there is no fear of a nuclear attach, yet we dread the though of a student or someone else bringing a rifle to school to create chaos, to kill. At the main intersection of Route 66 as it ran through the old downtown of Cucamonga sat Dee’s Diner. It was an old railroad car with seating along a counter. I got in a little trouble for sneaking out of school during lunchtime one day, going to Dee’s. I remember for the same price as lunch at school, 35 cents, I got a hamburger with fries and a piece of wonderful apple pie. The diner is gone now, and so are lunches for 35 cents. And there aren’t pies made like that anymore, either. The house that we lived in on Red Hill was along a wash that sat dry most of the year. It was only during the rare storms that it filled up with water running down from the mountains to the north. Across the wash there were orange groves. During the late spring, when the temperatures dropped, smudge pots were lit to ward of the frost that would destroy the newly budded oranges. Smudge pots burned oil, and produced an oily smoke that drifted around the groves, and out toward our house. A couple other memories come to mind about that house. One is that my dog, who had been on the ranch with us, got old and could no longer walk or eat. My mother and I had to take her on her last trip to the veterinarian. I loved Bonnie, a part German shepherd part collie. She’d sat with me, watching over me, while I as an infant slept in a pram in the yard by our ranch house. When my mom wasn’t home, I used to let her inside. Mom always new, for Bonnie shed long brown hair, leaving a bit of a mess. That house was rented. We lived there for two-and-a-half years then moved to a house we built on the other side of Red Hill. I don’t recall seeing the Hobo again. I wonder if he continued coming to the old house, and getting a meal for sharpening knives. I always thought that he may have traveled all over sharpening knives for people, all because my mother refused him a free lunch. I tried doing something similar once. I suggested to a homeless fellow that I’d give him lunch if he’d sweep the back room of a grocery store at which I once worked. He couldn’t be bothered. He didn’t need to work when he could go on to the next place and get something for nothing. Times had changed. It seems sort somehow odd that with the demise of the old Cucamonga, and the rise of an affluent and fancy, upscale city, the old hobos with a sense of personal responsibility and a certain integrity gave way to deadbeat homeless. It seems to me that Y’shuaJesus wants us to over a safety net to help those who truly can’t help themselves. But certainly Y’shuaJesus doesn’t intend for the nets to become hammocks upon which the lazy can lounge.